[205 Pages Report] A submersible pump is a machine whose assembly is submerged in the fluids that it has to pump. The main advantage of this type of a pump is that it prevents the formation of vapor cavities in a liquid. These pumps work by pushing fluids to the surface from their submerged positions, instead of pulling them to the surface from an elevated position. These pumps are designed in accordance to the different flow rates required for varying purposes across industries. Many major submersible pump manufacturers distribute their products in multiple countries through their regional subsidiaries. Independent distributors play a critical role in regions where manufacturing companies themselves don’t have a presence. The global submersible pumps market was valued at USD 8.8 Billion in 2014 and is projected to reach USD 12.2 Billion by 2020, at a CAGR of 5.4% during the forecast period 2015 to 2020. Asia-Pacific was the largest market for submersible pumps in 2014, holding a 41.7% share, and is set to continue its dominance throughout the forecast period. High demand growth is expected from the developing countries in this region due to the factors such as growing urban population, industrial development and growing infrastructure investments. Industrial sector is expected to be the largest application with 69% of the market share by year 2020. Major applications in the industrial sector include wastewater, sewage treatment & other effluent management activities, draining out water from holes during mining & construction activities, dewatering purpose in case of flood and other related calamities. Increasing deep water exploration activities and subsea operations provides huge opportunities for submersible pumps used in the oil & gas industry. However, the high cost of the submersible pumps compared to the conventional ones and other factors such as cost incurred in case of motor failure may inhibit its market growth. The market for submersible pumps has been segmented on the basis of type, operation, power rating, application, industry, and region to provide a detailed view to help identify growth areas and opportunities. This report provides an analysis of key companies and competitive analysis of developments recorded in the industry in the last five years. Market drivers, restraints, opportunities, challenges, and latest industry trends have been discussed in detail. The leading players in the market such as Xylem, Inc. (U.S.), Sulzer AG (Switzerland), KSB Group (Germany), Grundfos Group (Denmark), and Ebara Corporation (Japan) among others have been profiled in this report. 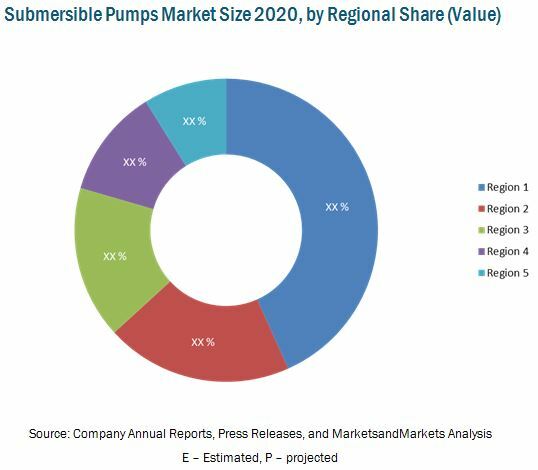 In 2020, Asia-Pacific region is projected to have the largest market for submersible pumps in terms of value due to the growing urban population in countries such as China, India, and Indonesia. Also, other factors such as agricultural, industrial, and infrastructure spending in almost all developing economies in the region are likely to boost the demand for submersible pumps. This report focuses on the global submersible pumps market, which has been segmented on the basis of type, operation, power rating, application, industry and region. This report contains market analysis and forecasts for important decision-makers among submersible pump manufacturers, distributors, raw material suppliers, component suppliers, and independent market analysts. The scope accordingly assists market participants to identify high growth markets and managing key investment decisions. The global submersible pumps market is projected to reach USD 12.2 Billion by 2020, at a CAGR of 5.4% during the forecast period 2015 to 2020. This report focuses on the submersible pumps market based on its various types and applications for different regions. The oil price slump in 2014 has slowed the growth of the oil & gas equipment and services market due to non-profitable extraction of crude from the fields. Due to this, the demand for submersible pumps used in this sector has slowed. On the other hand, the demand for submersible pumps used in other applications such as water & wastewater treatment, irrigation, and groundwater extraction showed notable growth in various regions across the globe. Industrial sector is expected to have the largest application for submersible pumps and is expected to have about 69% of the market share by year 2020. Major areas where the submersible pumps find applications in the industrial sector are in the wastewater, sewage treatment & other effluent management activities, draining out water from holes during mining & construction activities, dewatering purpose in case of flood and other related calamities, providing reliable source of water to process industries that requires continuous supply of water for operation and so on. The report provides qualitative analysis of the leading players in the submersible pumps market, with a clear insight and analysis of the development strategies used and preferred by them. The report also includes a chronology of the developments with respect to contracts and agreements (including joint ventures, collaborations, and partnerships), mergers and acquisitions, new product launches, and expansions. Key players including Xylem, Inc. (U.S.), Sulzer AG (Switzerland), KSB Group (Germany), Grundfos Group (Denmark) and Ebara Corporation (Japan) have been profiled in this report. The market dynamics in terms of market drivers, restraints, opportunities, burning issues, and industry trends have also been discussed in this report. This report provides detailed regional analysis for the submersible pumps market, including market size for important countries. Asia-Pacific region is expected to have maximum investments for the infrastructure developments, which will be a key driver of demand for submersible pumps. 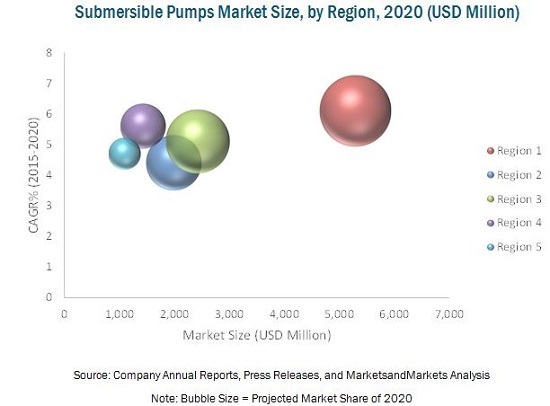 China, India, the U.S., Germany, and Brazil have been identified as the key countries for submersible pumps market owing to their current market size and potential for growth. 13.12 Tsurumi Manufacturing Co., Ltd.
13.15 Toyo Denki Industrial Co., Ltd.
13.16 Walrus Pump Co., Ltd.